Dog-friendly: Tilden Smith (left) and Dylan Balsz, makers of Petlawn. For Dylan Balsz and Tilden Smith, launching a successful pet business while undergrads at Chapman University in Orange, Calif., was a walk in the park … without the walk or, well, the park. The co-CEOs of International Pet Solutions are thriving with a product called PetLawn, billed as an "indoor outhouse for pets." 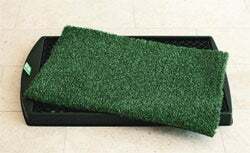 It's exactly that: a 20-by-30-inch patch of antimicrobial, odor-fighting artificial grass, lined with absorbent pads and equipped with waste bags--all so your dog can do his business without leaving the house. The "aha" moment, Balsz says, came when his family downsized from a house to an apartment. He found himself experimenting with homemade drainage systems in hopes of improving his dog's sanitary needs sans a private lawn. As a sophomore in 2010, he teamed up with classmate Smith to try to craft a viable business. Pooling money from friends and family members, as well as Balsz's savings from before college (a true entrepreneur, he operated an online medical equipment business while in high school), the pair launched their company in January 2011. While orders starting trickling in through word-of-mouth, PetLawn really picked up steam when it debuted at the SuperZoo trade show in September, attracting the attention of some of its first distributors: midsize chain pet stores in Southern California. Petlawn is an "indoor outhouse for pets." Now PetLawn is carried at nearly 200 U.S. stores (including Centinela Feed & Pet Supplies and Collar & Leash) and has a growing international presence, with distributors in Canada, Panama and Venezuela. International Pet Solutions projects first-year revenues of $160,000. Part of their success, the founders claim, is due to their focus on package design. Balsz says he and Smith looked at existing pet products and, for theirs, chose to push the packaging in "more of a modern and clean direction." "Not everyone who goes and buys this thing in the store initially knows it has more features," Smith adds. "I think what really catches people's eye is that our packaging is really cool; it's really bright, so people just kind of gravitate toward that." Both partners are juggling their course work at Chapman and the responsibilities of managing their company's growth. Smith aims to graduate in May 2012 with a bachelor's degree in business with an emphasis on entrepreneurship, while Balsz is eyeing a fall 2012 business degree with a focus on economics. It's not easy, they admit, noting they often travel between school and their warehouse in Santa Ana as many as four times a day to accept incoming and outgoing shipments of components and orders, and to supervise employees who are handling assembly. But being in school and being green when it comes to business has its advantages. In fact, Smith says, "people are willing to help you more if you're young. Initially, it would have been a lot more difficult to start the company if we didn't meet some really good suppliers that helped us along the way, because we came into this knowing nothing about plastics manufacturing." And, Balsz adds, while college life is busy, it may be the best time to launch a career: "As hard as it is in college, starting a business after college adds a lot of variables. If we had families to support or bills to pay, it would have been a more challenging decision. Instead, we just saw an opportunity and ran with it!"